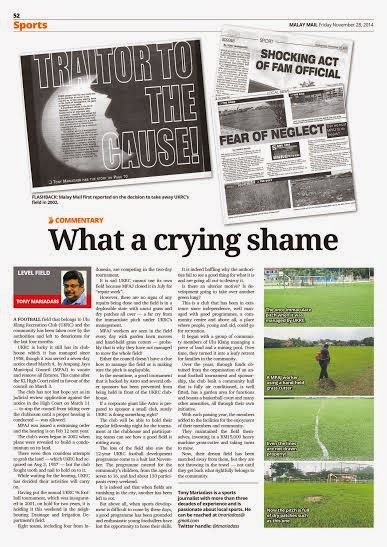 A football field that rightfully belongs to the Ulu Klang Recreation Club (UKRC) and the community has been taken over by the authorities and left to deteriorate for the last four months. UKRC are lucky they still have their clubhouse, which they have managed since 1958, though they were served a seven-day notice dated March 4, 2014, by Ampang Jaya Municipal Council (MPAJ) to vacate it and remove all its fixtures. This came after the KL High Court ruled in favour of the council on the field on March 3. The club have not lost hope yet as their judicial review application against the notice in the High Court on March 11 – to stop the council from taking over the clubhouse until a proper hearing is conducted – was allowed. MPAJ was issued a restraining order and the hearing has been set for Feb 12 next year. The community club’s woes began way back in 2002 when plans were revealed to build a condominium on its land (see flashback of The Malay Mail story). There were then countless attempts to grab the land – which UKRC had acquired on Aug 3, 1957 – from them but the club fought tooth and nail to hold on to it. While waiting for the hearing, UKRC have decided that their activities will carry on. After having put their annual UKRC 9s football tournament, which was inaugurated in 2001, on hold for two years, they are holding it this weekend – not on their grounds but in the neighbouring Drainage and Irrigation Department’s field. A total of eight teams, including four from Indonesia, are competing in the two-day tournament. It is sad that UKRC cannot use their own field because MPAJ closed it off in July, supposedly for repair work, and has not allowed any bookings. However, there are no signs of any repair work and the field is in a deplorable state with uncut grass and dry patches appearing all over it – a far cry from the immaculate pitch under UKRC’s management. Some MPAJ workers are seen in the field every day with garden lawn movers and hand-held grass cutters – probably that is why they have not managed to mow the whole field! Either the council doesn’t have a clue how to manage the field or it is making sure the pitch is not in playing condition for reasons best known to it. In the meantime, a good tournament that is backed by Astro and several other sponsors has been prevented from being held where it is supposed to – in front of the UKRC clubhouse. If a corporate giant like Astro is prepared to sponsor a small club, surely UKRC is doing something right. The club will be able to hold their regular fellowship night for the tournament at the clubhouse and the visiting and participating teams can see for themselves how a good field is rotting away. The loss of the field also saw the 12-year-old UKRC football programme come to a halt last November. The programme catered for the community's children, from ages 7 to 16, and had about 130 participants every weekend. It is indeed sad that when fields are vanishing in the city, another has been left to rot and denied to the public. But above all, when sports development is difficult to come by these days, a good programme has been grounded and enthusiastic young footballers have lost the opportunity to hone their skills. It is indeed baffling why the authorities fail to see a good thing for what it is and are going all out to destroy it. Is there an ulterior motive for their action? Is development going to take over another green lung? This is a club that has been in existence since independence, well managed with good programmes, a community centre and above all, a place where people, both young and old, could go for recreation. It all started with a group of community members of Ulu Klang managing a piece of land and a mining pool. Over time, they turned it into a leafy retreat for families in the community. Over the years, through funds obtained from the organisation of an annual football tournament and sponsorship, the club built a community hall that is fully air conditioned, is well fitted out, has a garden area for functions and boasts a basketball court and many other amenities, all through their own initiative. With each passing year, the members added to the facilities for the enjoyment of their members and community. They maintained the field themselves, investing in a RM15,000 heavy machine grass-cutter and taking turns to mow. Now, their dream field has been snatched away from them, but they are not throwing in the towel – not until they get back what rightfully belongs to the community.